Windows XP - "End of Life"
Important news for everybody who still has a Windows XP computer - Microsoft have announced that they are no longer going to support thatproduct beyond APRIL 8th 2014. This means that after that date, no more Windows updates will be issued for any security problems that may exist in Windows XP. Effectively, if a security hole is found by hackers or virus-writers, that hole will be permanently open and leaves your computer in serious danger of being attacked, putting your files and finances at risk. 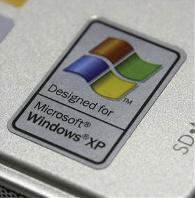 Most computers that run Windows XP won't be capable of being updated to use one of the newer versions of Windows such as Windows 7 or 8 because of limitations of the computer hardware (e.g. not enough RAM, too slow to cope with the more complicated newer version) and so the only option is to replace the machine with something newer. I encourage all Windows XP users to get in touch if you need help in choosing a new PC which is suitable for your needs. As many of you will know, Webcharm tend to point you towards a high-street retailer when sourcing new computers rather than sell you one directly. This ensures that the advice you get is independent and objective. Copyright © Webcharm 2014. All Rights Reserved.